House Majority Leader Eric Cantor loses the GOP Virginia primary to Dave Brat, who said Cantor wasn't conservative enough. House Majority Leader Eric Cantor, the only Jewish Republican in Congress, lost the GOP Virginia primary Tuesday night, Fox News reports. Cantor lost to Dave Brat, an economics professor and political novice who is a member of the Tea Party movement. 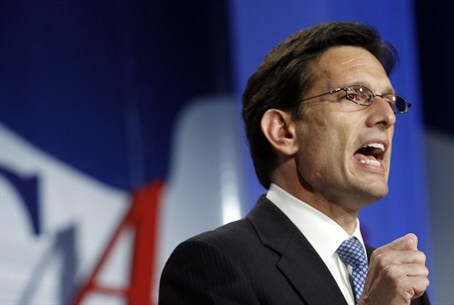 Cantor is the second-most powerful member of the U.S. House and was widely seen as the next in line to succeed House Speaker John Boehner. His loss is seen as a huge victory for the Tea Party movement, which supported Cantor just a few years ago, noted Fox News. Brat had been a thorn in Cantor's side on the campaign, casting the congressman as a Washington insider who isn't conservative enough. His message apparently scored well with voters in the 7th District. Tiffs between the GOP's establishment and Tea Party factions have flared in Virginia since Tea Party favorite Ken Cuccinelli lost last year's gubernatorial race. Cantor supporters have met with stiff resistance in trying to wrest control of the state party away from Tea party enthusiasts, including in Cantor's home district. Much of the campaign centered on immigration, where critics on both sides have recently taken aim at Cantor, according to Fox News. Brat has accused the House majority leader of being a top cheerleader for "amnesty" for immigrants in the U.S. illegally. Cantor has responded forcefully by boasting in mailers of blocking Senate plans "to give illegal aliens amnesty." He said that keeping Israel out of the “foreign aid looping” would allow the funding to be part of the defense budget, and not the foreign aid budget. In a meeting that year with Prime Minister Binyamin Netanyahu, Cantor promised that his party will act as a “check” on the Obama administration. Most recently, Cantor was one of several lawmakers who called on the Obama administration to suspend financial aid to the Palestinian Authority (PA) in the wake of the formation of the new unity government between Hamas and Fatah.